Oh Abby...I smiled with you, I cried with you and I held my breath as one awful thing after another happened to you. I hoped and wished for a happy ending...but I won't spoil it for others by giving away if you found one. Karen Barnett took a period of time that was tragic for so many and tells the beautiful story of one woman's journey to finding herself, letting go of others and finding love in the midst of tragedy. While some of the characters seemed a little flat to me, those of Abby and Robert stood out and kept me turning page after page. 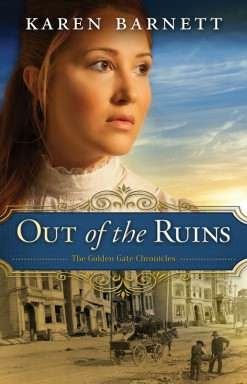 If you're a lover of historical fiction, there's a very good chance that you'll enjoy this book. Thanks for taking the time to review Out of the Ruins. I'm so glad you connected with Abby and Robert's story!